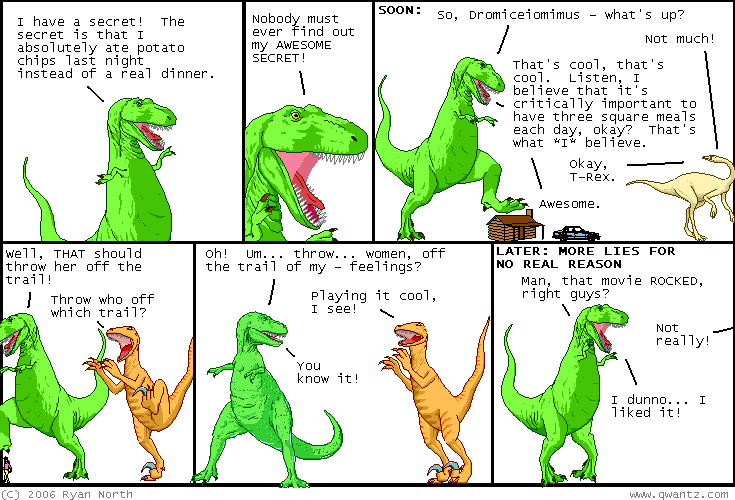 Dinosaur Comics - April 6th, 2006 - awesome fun times! –...and be happy for the time you shared! April 6th, 2006: Sorry there's no new Dinosaur Comic today (though there is a new Whispered Apologies I wrote!) - I am leaving Toronto in two hours for Operation Get Joey to New Jersey and will be in NJ for the weekend. Joey is like cargo in many ways. I'll be at The College of NJ for Joey's reading, and also be WHERE THE PARTY IS AT for non-reading times. I put up some more Mario question blocks up on Poster Child's site! You can see the blocks that made the news in Ravenna and elsewhere, as well as other blocks from Korea and the Netherlands. Finally, I was a runner up for the Blooker Prize. Cory Doctorow and Paul Jones said some very nice things about my book - thanks, guys! The winner of the comics prize was Zach's Joe and Monkey collection, and it's a well-deserved win! Zach's comic is absolutely charming and I recommend you check it out.